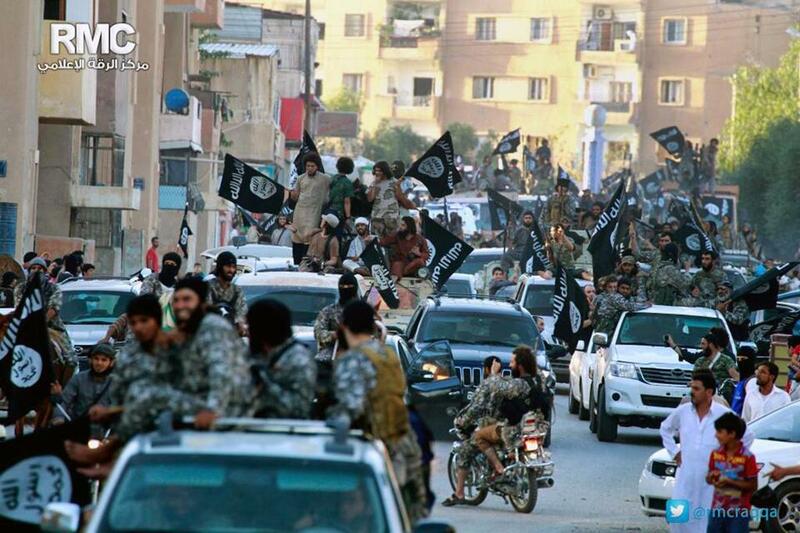 Islamic State fighters paraded in Raqqa, Syria. It’s no secret that President Obama has had a troubled year in foreign policy. Critics from left, right, and center have lamented a global strategy lacking in toughness, strategic direction, and results. During the past few months, many of America’s closest friends have openly worried about America’s leadership deficit in responding to war and revolution in the Middle East as well as Russian President Vladimir Putin’s aggressive push into Ukraine. But in the past few weeks, Obama has shown signs of a rethink and course correction that provide some hope of resurrecting America’s lead global role and Obama’s own foreign policy legacy. Obama is focusing first on the Iraq-Syria crisis, where the Islamic State’s swift and stunning advance this summer from its base in Northern Syria threatens the entire region. Obama unveiled this week a set of sensible steps to thwart the Islamic State over the long term. He will continue US airstrikes that have halted the Islamic State’s military advance threatening Iraqi Kurdistan and key infrastructure such as the Haditha Dam. He will also provide more arms and training to Kurdish peshmerga forces and the weak, divided Iraqi army. Meanwhile, Obama must decide whether to strike inside Syria itself and arm more aggressively the moderate Syrian rebel forces competing with the Islamic State, also know as ISIS. It will be a roll of the dice given the difficulty of working in a Syria decimated by civil war. But the United States probably can’t succeed without joining Syria to the Iraq strategy. And air power alone won’t work. As he pieces together this new battle plan, Obama must answer a pivotal question: Do we seek to contain the Islamic State or defeat it entirely? In order to defeat the thousands who fight for the Islamic State, Obama will have to be persuasive on two fronts. First, he will need to convince the American people and Congress to support a multi-year campaign that will be bloody, costly, and demand long-term strategic focus and patience. Second, the emerging US-European coalition cannot succeed alone. He needs to expand it to include key Sunni Arab states. Saudi Arabia, Kuwait, and the United Arab Emirates have talked a good game but now need to contribute actual forces to the fight and do much more to dissuade their own citizens from funding Sunni jihadi groups. We should insist on that. And NATO ally Turkey must act more boldly to police its borders, to stop the flow of jihadist fighters into Iraq and to prevent the Islamic State from exporting oil to fund its savage killings. Obama’s foreign policy comeback depends on success in Iraq. But it must also include a more resolute effort to contain a truculent and troublesome Putin in Ukraine. At last week’s NATO summit in Wales, Obama led an impressive effort to rebuild NATO’s core military capacity. He and European leaders also made a strong, credible commitment that the Baltic states and Poland would be defended under NATO’s Article V treaty guarantees should Putin seek to intimidate or threaten them. But NATO missed the opportunity to impose harsher sanctions on Putin and to deliver defensive arms to an embattled Ukrainian government. Obama must now convince reluctant and often timid West European leaders to move forward on both. This would be the most effective riposte to contain a cynical Putin bent on dividing Europe again after the Cold War’s end. Obama has more than two years left to rebuild and reenergize a drifting American foreign policy. That is more than enough time for this smart, sensible, and now experienced president to regain the initiative. What he needs to do most is to renew our trust in the irreplaceable role of the United States in Europe and the Middle East. He should insist that Congress make no further cuts to the defense budget in light of these new threats. He is right to push the Senate to end its shameful partisan foot-dragging in refusing to confirm 65 American ambassadors. Friends of his administration, myself included, want to see him embrace with more conviction his leadership of an American global strategy vital to the West. Anything less won’t work in confronting corrupt despots like Putin and the uncivilized barbarians who lead the Islamic State.